Ryan and Megan of the super-fun band Tipper Whore tease and please with info about their live gigs and upcoming EP release. Hiya Ryan and Megan! Ryan, I adore your previous bands The Lolligags and Meringue & Malice with co-star Leslie Dallion and now I’m super-psyched about your involvement in Tipper Whore! Who’s in the band and what roles do you play? Ryan: Tipper Whore is Meredith, Megan, Kelly, Jason, Nick, and myself. Some of us play guitar, some of us bang drums, the others jump up and down and sing naughty songs. We are all troublemakers. Your debut 7” of the extremely sticky “Two Sticks” and “Day Drunk” dropped this past Valentine’s Day on yk Records. Why yk? Are they based where you are in Nashville? Are all the band members now located in this environs or is everyone still scattered all over the USA? Megan: Michael Eades is the founder of YK Records. He has become a good friend of ours. He was at our first show ever which was a house party in September of 2012. He was so impressed with how good we sounded for such a young band that he offered to release our single. We were so flattered! We are very excited to a part of his label. He was based in Nashville until a couple months ago. Now he is actually based out of New York City. Ryan: And the band all lives in Nashville. We believe it is the soon-to-be rock capital of the USA. “Two Sticks” is a little rock, a little camp, a whole lot of sneakily cheeky double-entendres, and 100% catchy and fun. I particularly enjoy your alternating vocal lines. How did you hit upon the idea of having male lead vocals and accompanying female vocals? Will/do all your songs fit this template? Ryan: I never planned on singing, it was an accident. Meredith sent me lyrics and I made them into a song. Suddenly I was being forced to sing! But I’ve come to enjoy it. Megan: It made sense for Ryan to sing the songs. He writes the music and it fits his vocal style. But having the alternating female vocals gives us a different sound as well. Plus we get to play different roles throughout some songs which is fun. Ryan: Yes, I think it’s more fun to watch the vocals bounce from one person to the next. And it lets me breathe for a second. Ryan, to my ears you sound like the bouncing baby boy of a mellow John Lydon (Now there’s an oxymoron for ya! ), a deadpan Fred Schneider (Wait, that’s redundant. ), and at times, in the live setting, a florid Morrissey (Wait, that’s also redundant!). Does my assessment float your boat or sink your battleship? Ryan: Those are all very nice comparisons, indeed! I do try and push for some John Lydon snot & sneer, certainly. Maybe a bit more melodic. Melody is everything. Megan, I love your vocals too and you play a mean bass. How did you get into playing bass guitar? Megan: Thanks! I started playing guitar when I was 12 and always had a lot of fun with it. In college I was asked to play bass in an all-girl band called Bent Fur. I was up for the challenge so I started learning bass. I've had a lot of fun working on it. Plus everyone loves a chick bass player! You’ve described the band’s sound as “a little B-52’s, a little riot grrrl”. Ryan, I know that your former musical partner, Leslie Dallion, was a guest vocalist on a Fred Schneider The Superions song, so I’m wondering if you have a connection with the B-52’s band members. Ryan: Leslie and I worked on the Superions remix together with Fred Schneider’s input, but other than that, no. I will say that when I can’t figure out a melody for a lyric, I think, “How would the B-52’s girls Kate & Cindy sing this?” That works beautifully. What is your favorite riot grrrl band? Mine is Bikini Kill all the way. Kathleen Hanna rocks and now she pops in The Julie Ruin! Ryan: Yes, I adore Kathleen Hanna! Some of the riot grrrl records have certainly inspired our chord progressions; the intensity of those songs cannot be denied. My fave is probably Huggy Bear, maybe for the boy / girl vocals. I’ve heard a couple three songs of yours from video footage of your live shows on YouTube. You drop the F-bomb repeatedly amid a tuneful groove in one of them. Will that song and the others make their way onto vinyl/digital? Is another 7” or EP or album in the works? Megan: That song is "Benjamin Braddock is a Mother F*cker!" which is our take on "Mrs. Robinson" and tells the story of the Graduate. That song will definitely be on our next EP which will be released in early 2014. Ryan: Cursing in songs is such fun, everyone loves a sing-a-long all the more when they get to say bad words! Speaking of video, the one-take shot for “Two Sticks” is enormously enjoyable. Who thought up the concept and who participated in the video besides the band members? Ryan: Meredith came up with the camp kids idea, and Jason suggested that we all walk by the camera with the action slowed. Our friends showed up to help! Some of those folks are in Nashville bands like Cry Baby, Scale Model, El El, and the rest are friends who wanted to stuff marshmallows in their mouths and get scared by snakes. I think all or most of you have played in other bands, with one of you, ummm, playing the shovel. How does that happen (the shovel part) and is anyone currently concurrently active in other bands? Megan: Our drummer Nick was in 3 bands at the beginning! He stepped down from one of them and now just plays mostly with us but also in the Metal band, Freebase Masons. Kelly plays in another band occasionally as well. They also put together a Ween tribute band for Halloween. Ryan: And they won the tribute band contest! Meredith is quite resourceful, she’ll bang on anything she can get her hands on. The shovel served a cowbell purpose but is much more dramatic! Jason painted ‘TW’ on a shovel for her last Christmas. You started out by playing in a band member’s garage, drinking liquor and eating cupcakes. Since I’m a sugar fiend, I must ask, what is your favorite type of cupcake? I’m partial to Red Velvet cupcakes when done right. Megan: I agree with you on the red velvet! That is my favorite cupcake for sure! You snagged a gig with Electric Six – so exciting! How did it go? Ryan: It was a blast. 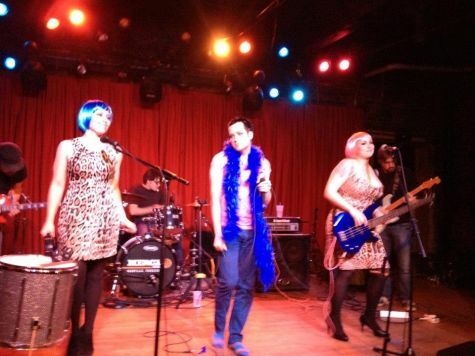 Our first cover was “Gay Bar,” so it just seemed fitting that we play with them. Megan: Yeah, playing with Electric Six was so much fun. It was such an honor to open for a band that we covered at our very first show! You’ve been known to dress up for shows, as doctor ‘n’ nurses and the like. What are your fave outfits to wear live and do you change it up fashion-wise for each show? Decoratively, what is most crucial – eyeliner, lipstick, glitter, or hairspray? Goodness, I actually got a John Waters reference in there! Megan: We try to switch up our theme for each show. The nurse/doctor theme will always be one of our favorites. My personal favorite was a burlesque theme we did recently for Bitchfest. I feel like it was the sexiest one we've done yet. We also rock a pretty good Catholic school kid theme. Our make-up is a big part of who we are. We love to be covered in glitter. Some shows Ryan will pour glitter all over us and the audience. We leave a lasting impression that way for sure! Ryan: At this point, I find it funny that bands wear their own clothes on stage. But whatever makes you comfortable. We’re just more at ease in fishnets and corsets and sequins. OK, you can’t be day drunk 24/7, since I think you have day jobs too. Megan, Ryan let slip that when not in the band, you’re a flight attendant. Any wild stories to tell? Megan: It's true I do have to be sober at work. Unfortunately, Ha! But yes I am a flight attendant. My favorite stories to tell involve all the celebrities I get to meet. I've been on a plane with Lady Gaga, Lance Bass, Emma Stone, Sally Field and the guys from Duck Dynasty. There have been tons more those are just the first ones that came to mind. I’m still trying to figure out importance (or not) of Twitter. You have a Twitter account. What do you tweet about? Stuff like how to make an alcoholic cupcake? Now that would be something to tweet about! Megan: I think all social media is important to market ourselves. We treat twitter as a way to talk about upcoming shows or songs. We like to give shout outs for other local bands. Twitter might not be my favorite social media outlet but I like using it for Tipper Whore. Ryan: Megan’s fantastic Tipper Whore vines have been written and talked about! They are quite the rage! Lastly, can you please list your official site(s)? Our website is www.tipperwhore.com with Lichtenstein-ian artwork done by our friend Matt Hearn! Because we’re really just comic book characters.